This lovely holiday cottage in the historic village of Kincardine O'Neil offers excellent self-catering accommodation - ideal for a family holiday or a fishing holiday in Deeside. 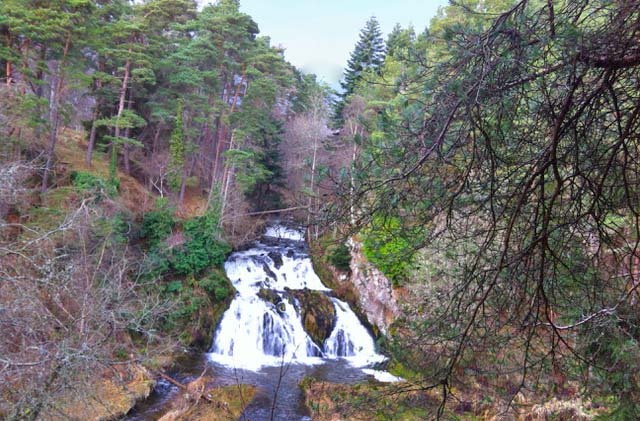 Designated as an Oustanding Conservation Area, Kincardine O'Neil is a small village in the middle of Royal Deeside and a great location to explore the many places and sites of interest in the area - the surrounding scenery is stunning. Deeside is full of interest. Aberdeenshire's castles are spectacular and Craigievar, Castle Fraser, Fyvie, Drum, and of course Crathes Castle and its world famous gardens are all within easy reach. The spectacular coastline with cliffs and bird sanctuaries (Fowlsheugh), castles (Dunottar), picturesque fishing villages tumbling down hillsides and spectacular beaches are worthy of a visit. For the active there is a myriad of walks from a 15 minute circuit to the river Dee to a day-long hike through the mountains. The Dee is, of course, a world famous salmon river and even if you don't want to fish for them it is fun to sit a while on the beautiful bank and see the salmon jumping whilst enjoying the peace, the wild flowers and the wildlife such as otters, dippers, oyster catchers, duck and deer. Other activities include golf, riding, gliding, cycling, and for those wanting organised action the nearby Deeside Activity Centre is only 3 miles away. To the west the hills surrounding the Dee get higher and steeper and the scenery ever more spectacular. 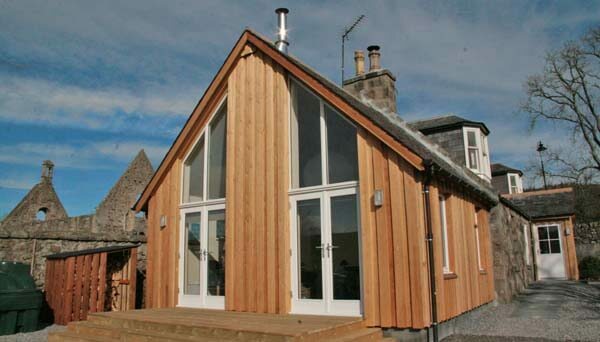 The Cairngorms National Park is just 7 miles away. Drive up to Loch Muick and take a 10-mile hike around the loch in true highland solitude and understand why this area has been a favourite of our Royal Family for 150 years. The Queen's highland home, Balmoral Castle, is open to visitors from Easter to the end of July and is a 30 minute drive away. There are shops in Kincardine O'Neil, including an excellent village store, as well as in nearby Banchory, Aboyne and Ballater. Skiing is available at Glenshee and the Lecht, both approximately a 35 mile drive. The Deeside Gliding Club is 7 miles away. 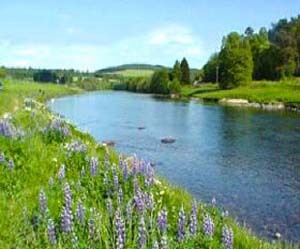 Fishing can be arranged on local stocked ponds or the river Dee and the Cairngorms National Park is on your doorstep. You are guaranteed not to be short of things to do and places to explore if you spend a holiday or short break in Deeside! Bridge Cottage was converted from two tiny cottages and extended again in 2015. On the ground floor a porch, with space for coats and boots, leads to the hallway, bathroom, bedroom with en-suite shower room, dining room, kitchen, sitting room and deck area. Upstairs are two more bedrooms. 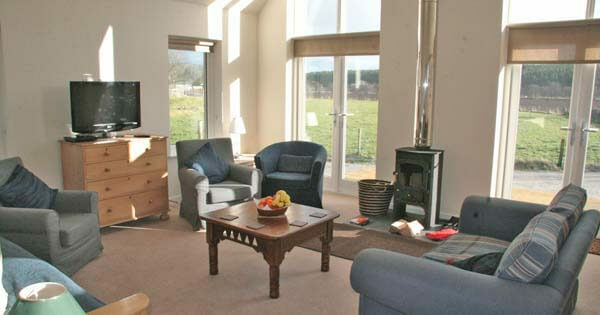 A further two people can be accommodated on a sofa bed in the large sitting room. 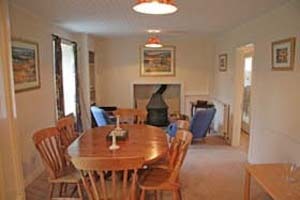 There is full oil central heating plus a log stove in the sitting room. 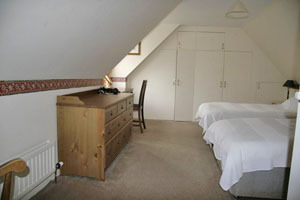 It is comfortably furnished throughout including a TV, CD and DVD players, WiFi and telephone. The property has a small garden which extends from the front of the cottage to the Neil Burn - it's mostly fenced, but isn't dog-proof. The property is often let to salmon fishermen and so is equipped with an outside, lockable rod-box and fishing maps. For those who are less mobile there is ramp leading to the porch and there are no steps thereafter. There is a bedroom and bathroom on the ground floor. By Road: Kincardine O'Neil is on A93 between Banchory and Aboyne. Bridge Cottage is the cottage immediately east of the ruined roofless mediaeval kirk which is an obvious landmark. Access is via a short drive and there is parking for 4 cars. The nearest airport is Aberdeen, a 35 minute drive away. All bed linen, towels, heat, light and a supply of logs are included. Bridge Cottage is rented out year round. Rental periods are Sunday-Sunday, arrival after 4pm and departure by 10am please. Short breaks available by arrangement. Discounts for longer stays. 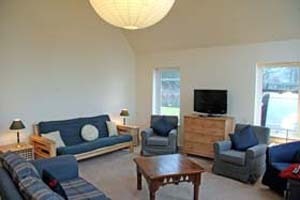 To book this superb holiday cottage near Aboyne, click the enquiry button below and see prices and availability. 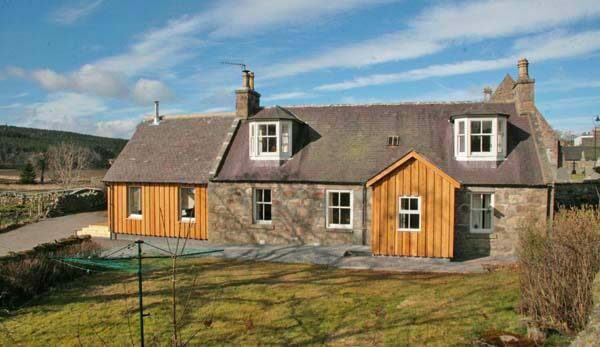 This delightful Deeside holiday cottage is ideal for a family holiday. It's also perfect for a fishing holiday and salmon fishermen often stay here. There's a lockable rod-box and fishing maps provided and fishing on the Dee can be arranged.